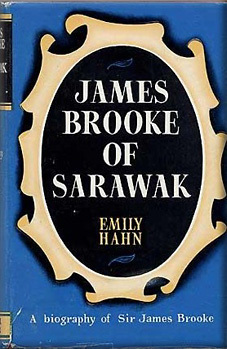 This biography of the first white Raja of Sarawak, James Brooke, was actually written in the 1950s and only shortly after Sarawak had been turned into a British Crown Colony after having been an almost feudal state passing through three generations of Brookes before the maelstrom of the Second World War brought its unique status crashing down. Even then, there were still many people in Sarawak who pined for the days of the White Raja with one of the British governors even being murdered by a pro-Raja group irked at the British usurption of their feudal state. Written so shortly after the ending of this bizarre but interesting colonial outpost Emily Hahn clearly connects with the participants in a way that perhaps modern historians would struggle with. Emily Hahn is clearly sympathetic to her subject, but then again it does seem that there is a lot to admire about James Brooke. He comes across as a surprisingly modern leader who is more detached from his contemporary attitudes than he is with modern ones. He clearly had limitations, such as in finance, overly sensitive on some issues and not the world's greatest communicator on paper. But he also clearly inspired devotion, was very protective of his charges and had a surprisingly open mind to new ideas and concepts such as towards evolution and religion. He clearly tussled with the necessity of opening up the local economy whilst fearing the impact that it might have on the local population. He in no way was an imperial exploiter and often used whatever wealth he was able to acquire for the good of his people and territory. It is clear to see why writers such as Kipling and Haggard were inspired by James Brooke's story to write fictional accounts of white rulers in exotic landscapes but as is so often the case the truth is often far more interesting than fiction. It certainly seems to have been the case with this ex-East India Company man who was inspired by Rousseauian ideas of the 'noble savage' to wish to find his own Garden of Eden uncontaminated with European squabbles and industry. However, his ever inquiring mind led to him acquiring a sizeable library in the midst of his jungle empire and discussing philosophy, religion and ethics with the small but ever growing band of hardy Westerners keen to see for themselves his noble experiment. Certainly his intrusion into nation building was almost accidental according to Emily Hahn. He was certainly intrigued by the island of Borneo but it was apparently the pleadings of local Malay rulers that induced him to stay. His ex-soldier skills combined with the ship and crew he had purchased for himself to make a formidable military presence in a country riven by civil war and pirates. His decisive and daring exploits earned the respect and inspired loyalty which ultimately transferred down the generations. He was not just a man of action who could impose peace. He also followed up his exploits by implementing a fair justice system that respected the local cultures and religions but that place them all on an equal basis. This had not been the case previously where the ruling elite had used justice to further their own ends. Spending months at a time hearing petitions and solving long standing and hitherto seemingly intractable problems. He understood that security, peace, law and order were vital precursors to establishing trade and increased economic opportunities. His relationship with the Royal Navy in the 1840s was particularly important in establishing his regime. His campaign against pirates coincided with a Royal Navy expanding into the area after the seizure of Singapore, Hong Kong and the identification of China as an increasingly important trading partner. The last thing they wanted was pirates in the South China Seas disrupting that. It also coincided with a period when the Royal Navy's officers had generous latitude to take initiative and solve problems in an era of very poor communications. Charles Brooke's relationship with Henry Keppel were particularly important in this regard as the kindred spirits helped reduce the reach and ambition of pirates operating out of Borneo and had all but destroyed it by 1849. Emily Hahn's book makes it clear though that concerns back in Britain about the ethics of attacking far off savages made some liberal opinion queasy. When allied to hostile businessmen who were annoyed at James Brooke for his perceived slowness in opening up the Sarawak for commercial exploitation, he had a long drawn out political battle to deal with. Emily Hahn's opinion is certainly on the side of James Brooke whilst putting the alternative case forward - but in a way that makes it very obvious where her loyalties lay. For example when she stated that one of the principle complainants, Robert Burns, stated that there were no pirates in Borneo to do battle with in the first place. She then takes pleasure in revealing: "An Awkward thing had happened to Mr Burns's argument... Mr Burns's head had been cut off by pirates - or rather as Mr Hume (the politician leading the campaign in Westminster) would probably have said, by innocent natives who were not pirates at all." The author does have a cheeky manner that shines through time and again. She is a partial witness but a fun one nonetheless. She does make some incisive comments as well, items that may seem to be throw away lines but reveal a fascinating insight into a bygone era. I particularly enjoyed her comment about the arrival of wives and women into the colonies: "Before the ladies came the native chiefs came in every evening after dinner and joined the assembly in the great hall, and chatted man to man with the British. Now, the gentlemen after dinner were impatient to join the ladies in the drawing room... The chiefs soon realised they were no longer welcome. so they stopped coming." This one quote illustrates an issue which swept across many colonies throughout the British Empire and perhaps helps explain upheavals like the Indian Mutiny or the later Boxer Rebellion. It encapsulates the change from swaggering adventurers sympathetic and understanding of their host cultures to the era of stultifying officialdom and transferance of British culture and values throughout the diverse empire. It is for lines like these that this book is worth reading. There are problems with Emily Hahn's book, other than its sympathetic stance. The language and style does feel a little alien to a modern reader but it is still accessible. Perhaps for me the biggest disappointment was the final chapter. It almost felt as if the author was working to a tight deadline and had to finish the book in a hurry. At 255 pages it is not overly long, but the last few years of James Brooke's life barely gets a look in. The transfer of his heir from Brooke Brooke to Charles Brooke is mentioned but its consequences and effects are barely mentioned at all. Indeed even his semi-retirement in Devon is barely mentioned at all - nor his final fate and resting place - which are fascinating in themselves. The book starts very strong but comes to a panicked and overly hasty ending - which is a shame as I had really enjoyed James Brooke's company and Emily Hahn's recounting of his life up until the last half decade of his life.